A wide variety of wood burning devices are available today. Designs as well as technology have dramatically improved over the last two decades. This publication will discuss differences in wood heating systems, especially those between EPA-certified units and those that are not certified. Most of the characteristics discussed below apply to both cordwood stoves and pellet stoves, but some are more specific to the particular fuel source. Performance parameters and ratings are provided by the manufacturer both as information to consumers and marketing tools for salespeople. It is important to understand the information presented by manufacturers in the decision-making and purchasing process. Often performance parameters are used to describe performance of wood burning appliances in a similar fashion to the Environmental Protection Agency (EPA) fuel efficiency ratings (i.e. miles per gallon) for vehicles. However, not all of the data provided on product brochures are standardized and regulated. 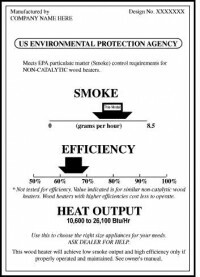 EPA certifies emission rates and high/low BTU (British Thermal Unit) output ranges for wood stoves. This information is very useful and specific to the stove model, but because models vary widely the information is not easily compared from one model to the next. Consumers should also be aware that EPA-approval indicates that the model has been tested in an EPA-certified laboratory as being able to meet certain uniform standards. However, consumers operating the equipment in the “real world” may not achieve the same standards the EPA achieved under controlled conditions. Other performance parameters that may be listed in product literature include: efficiency, heat output, heating capacity and burn time (see table below). Test methods for calculating these parameters are not standardized or regulated – meaning manufacturers can define them differently. Hence, using these ratings to compare different models has to be approached with caution. These numbers may provide some initial information, but because of the difficulty in comparing models, and the fact that there are many other factors to selecting a wood burner for a specific site, the numbers should only be part of the selection criteria. A reputable dealer will likely be able to recommend the right stove for a particular situation and ensure consumer expectations of their new heating appliance are met. Example of performance parameters a consumer might find in a product brochure. The following are some of the terms commonly found in manufacturers’ brochures, and on appliance labels. Efficiency ratings found on most, if not all, wood burning units are unspecific and can be fairly ambiguous. The reason is that assigning a single “efficiency” number when heating with a wood burning appliance is complex. For example, one measure, combustion efficiency, indicates how completely the wood burns. Another, heat transfer efficiency, is a measure of how much of the energy released is transferred to the space to be heated. These measures will both be influenced by when the wood is burned and whether the wood is properly seasoned (as described in Step 4), etc. The EPA certification of wood burning appliances provides a good guideline for efficiency. While EPA certification only assesses compliance with particulate emission limits (see factsheet on Emissions), higher overall efficiency is correlated with lower EPA limits for particulate emissions. Between 60% and 80% overall efficiency (combustion and heat transfer) is considered a reasonable range. Lower than 60%, and too much energy goes up the chimney rather than heating the space. Overall efficiency higher than 80% in woodstoves may have drawbacks. High efficiency units are designed to use as much of the stored wood energy as possible for heating, as opposed to allowing the energy to escape out the chimney. However, units with efficiencies above 80% utilize so much of the stored wood energy for heating that they have a low exhaust temperature, which could lead to a weak draft and increase the risk of water vapor condensation in the chimney. Heat output is listed as maximum heat output in British Thermal Units per hour (BTU/hr). Typical heat output ranges are between 25,000 to 80,000 BTU. The measure, however, is a maximum output. Just like running a motor at maximum possible RPM for prolonged periods of time, running a wood or pellet stove at the maximum heat output can cause damage to the unit. For consumers, some of the more valuable heat output numbers are the high and low BTU output ranges, which are reported on the EPA tag (label). The high/low output ranges tell a consumer how much heat a unit can produce and how low the temperature can go by design, while still burning cleanly. It is important to look for a unit with a broad a range so it can be used comfortably more days out of the heating season. As with all numbers, the high and low output ranges are estimates of real world conditions. Heating capacity, usually provided as square feet of space the unit will heat, is a very subjective performance parameter because of the many non-stove related factors involved. Climate zones (e.g. California vs. Michigan), insulation levels/air tightness of the space to be heated, floor plans (open vs. fragmented), height of the space, as well as the kind of wood used, all need to be considered. These factors make the manufacturer-provided rating highly variable as a decision making tool. A factor that often does not appear in the numbers, but is important to consumers, is the burn time. In other words, consumers want to know how often they will need to add wood in the firebox or reload the hopper on a pellet stove in order to keep the space comfortably warm. Unfortunately, there is no perfect response. “How long will this stove burn on a single load/hopper full of wood/pellets?” is similar to, “How long will this car run on a tank of gas?” Burn time depends on three main factors: fuel quality (what kind of wood and its moisture content), heat demand, and the size and orientation of the firebox. Of these, fuel type and heat demand will have the largest influence. For example, dry Ponderosa pine burned with the vent wide open will provide moderate heat for several hours. Douglas fir will provide twice as much heat. A closed air supply vent will provide for less heat – though a burn time of 8+ hours. It also depends on other features of the unit. For example, due to their design and capability of burning with low emissions at lower temperatures, good catalytic stoves can deliver a lower burn rate over a longer period of time than their noncatalytic counterparts. A full automatic pellet stove controlled by a thermostat might need a refill of the hopper only once a day, depending on space heating demand and hopper size. The best resource to make sense of all these ambiguous numbers and to recommend the right stove for a particular situation is to ask your local dealer for the pros and cons of each stove manufacturer and type. If possible, ask for references of people who have been using wood stoves and get their feedback. EPA Phase 2 units have a white tag and are about 90 percent cleaner than unqualified units. EPA’s Phase 1 models are no longer considered “qualified” under the Program. Wood-burning appliances that are “qualified” under the EPA’s Voluntary Hydronic Heater and Fireplace Program are NOT “certified” per EPA’s New Source Performance Standard for New Residential Wood Heaters. Contact your state or local air quality agency for clarification on the type of wood-burning appliances, if any, which may legally be installed in your area. As of this writing, EPA with input from industry is in the process of developing new, tighter emissions standards for wood burning appliances. The proposed rules would tighten emissions standards in a two-step process: For new room heaters, which include pellet and wood stoves, the emissions levels proposed are 4.5 grams/hour in the first step, and 1.3 grams/hour in five years. The proposed rule also would eliminate separate emission targets for catalytic and non-catalytic stoves in favor of a single number, due to technology improvements that make separate standards unnecessary. For hydronic wood boilers, the step one-level is already met by a number of models with emissions of 0.32 pounds of particulate matter per million BTU heat output. The steptwo level to be met in five years would cut that in half to 0.15 lb PM/MMBtu. As with most things, certain parameters change for wood burning devices over their lifetime. According to the U.S. Environmental Protection Agency, certified woodstoves degrade with use, but they still burn cleaner than uncertified stoves, and on average, after about 7 years they still have lower emissions than uncertified conventional stoves. Wood stove change-out programs, where the replacement of old, inefficient and polluting woodstoves with new, cleaner-burning technologies like gas, wood pellet, and EPA-certified wood stoves are encouraged and subsidized through direct grants, equipment donations and in-kind support, have been implemented across the country, including Libby (2008) and Seeley Lake (2012) in Montana. These programs commonly are offered in areas with elevated levels of air pollution caused by wood smoke. CAUTION: “Meets EPA Requirements” or “EPA exempt” is not the same as “EPA-Certified” or “CSAB415.1 Certified” as some advertisements might suggest. These stoves do not meet EPA emissions standards. They just meet requirements to be exempt from emissions standards.